The new European Arctic policy embodies key Finnish priorities for the region. Environment, climate change, sustainable development and international relations are the top EU priorities for the Arctic, the new European policy document for the region reads. However, unlike previous EU communications on the region, the new policy also gets concrete on issues of infrastructure development and regional investments. Among the ambitions outlined is the development of infrastructure connections to the Arctic Ocean. The policy document was presented on Wednesday by European foreign police boss Federica Mogherini. For the years to come, it will be a key guiding document for EU actions in the high north. 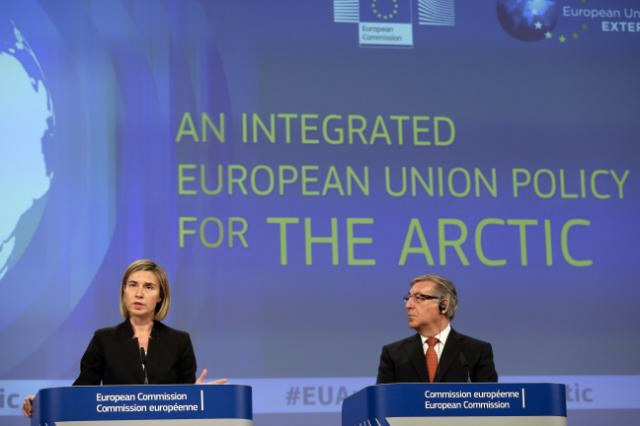 “The Arctic is crucial in terms of regional and global security, and a strategic component of our foreign policy”, Mogherini said in her presentation this week. The document regrets the lack of a complete north-south traffic connection and argues that the EU should «explore the merits of strengthening links to the Arctic through trans-European networks, for example from Finland to Norway, providing access to the Arctic Ocean». It also explicitly mentions the Trans-European Network for Transport (TEN-T), an initiative which aims at developing infrastructure connections between the northern parts of Finland, Sweden and Norway. Regional railway lines and ports constitute key components in the network. Among them is the Norwegian port of Narvik and the Malmbanan railway connection to the Botnia Bay. The document stresses the need for more investments, arguing that «the European Arctic is suffering from underinvestment». Available investment mechanisms for the region should be harmonized. The document also promotes the Juncker Plan for Investments in Europe, the ambitious European multi-billion investment program, as instrument for Arctic initiatives. To follow up the initiatives, the Commission says it will set up a European Arctic stakeholder forum, which is to «enhance collaboration and coordination between different EU funding programmes». Furthermore, after 2017, it will fund and facilitate an annual Arctic stakeholder conference in the region to «strengthen collaboration and networking between stakeholders to improve capacity building, international project development and awareness of financing sources». Finnish government ministers might nod approvingly at the new EU document. Over the last years, Finland has worked consistently to sharpen its policies towards the High North and promoted its positions both bilaterally with neighboring Norway and Sweden, as well as internationally in the EU. For the Nordic country, infrastructure development is the key thing and on top of the wishing-list is a new railway connection between northern Finland and the Norwegian Arctic coast. Thus, as EU officials in Brussels have worked with the European policy, former Finnish PM Paavo Lipponen has actively lobbied Finnish Arctic interests. In a report, the renown former politician underlines that Finland can become a logistical hub of global significance considering its geographical position between the EU and the Arctic. Those positions are highlighted also in Lipponen’s memorandum to European Commission President Jean-Claude Juncker from November 2015. Both the Lipponen’s recommendations and the EU policy come timely ahead of Finland’s take-over of the chair in the Arctic Council. The EU policy document itself highlights the importance of the upcoming Finnish chairmanship. «It will offer an opportunity to bring European ideas and initiatives to the work of the Arctic Council», the policy reads. As previously reported, Finnish Premier Juha Silipä recently highlighted his interest in the construction of a railway line from Rovaniemi, northern Finland, to Kirkenes on the Norwegian Arctic coast. The infrastructure connection could become a priority issue for the upcoming chairmanship period in the Arctic Council, he said. Finland takes over the council chair in spring 2017.